THE WRITING BUDDHA - Opinions | Books | Movies: The Unwanted Shadow by Bhaskaryya Deka (Book Review-4*/5)!!! 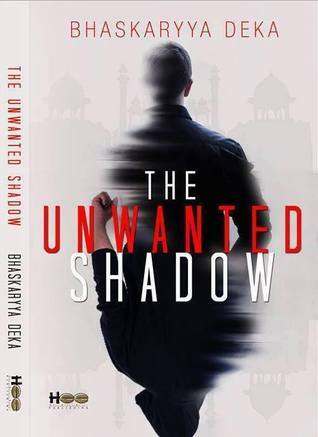 The Unwanted Shadow by Bhaskaryya Deka (Book Review-4*/5)!!! I completed reading Bhaskaryya Deka's 2nd book "The Unwanted Shadow" in some 3-4 hours. And I tell you, friends, that the book does not let you feel you are out of that world even for a second or two. Seeing the cover page and title of the book, I was quite doubtful as I expected it to be a love story and couldn't understand what an unwanted shadow and thrilling look is all about. But now after completing it, I can say that this is one of the most interesting book I have read even when it is written on a very serious note. Bhaskaryya has used a very easy and powerful language to convey whatever he wants. His narrative style in this book has been as if you are reading an autobiographical take on one's life. This makes the book more interesting. He has invested all the time in expressing different character, their thinking, their ideology and passing on a beautiful story to us rather than narrating useless conversations in length as many Indian author-by-chance do. Another good decision by the author has been his idea of keeping the book of just 166-pages even when with the kind of plot he had chosen, the book could have easily be made of more than 250 pages. This tells a lot about the author. He didn't want to fool his readers but give them a lot in a limited period of time. The way author first describes life of the protagonist in his homely environment, then he takes another gear and describes his life in Delhi. Again another gear and he describes his life in prison and one more gear where he finally describes his life in rehabilitation center. And the way he portrays the book in 4 different environments is what makes this book special and unforgettable. Author does not even discuss a probability of what the real story behind a tragedy is throughout the book which is why climax shakes you off your seat. And that's very hard to do and Deka has generously achieved it through his skills. Even with a plot and whole setting like this, the way book is given a happy ending is what actually delighted me. This book makes you think about it even hours after you are done reading it. And that's the specialty of all the emotions perfectly put down by the author without making any silly mistake. I would say this book is BADLAPUR version of Indian pulp fiction genre. If you loved that movie, you should surely go down to read this book as it is more brutal and surprisingly better than the movie. Though I haven't read Bhaskaryya Deka 1st book but he is surely a writer I would look forward to read in future. Ila Garg have beautifully edited this book. I give this book 4* out of 5 easily just because of its narration right from the first page, the climax that doesn't let you believe the story and the after-effects this book generates once you complete reading it. Kudos to the author. Love your Indian author reviews!